I always just love working with Kandinsky and all his brilliant primary colors. Just had to do this one large format! It's hard to believe how many paintings he did in black and white at one time in his career. See some of his black and whites at the link below - Kandinsky at MOMA. 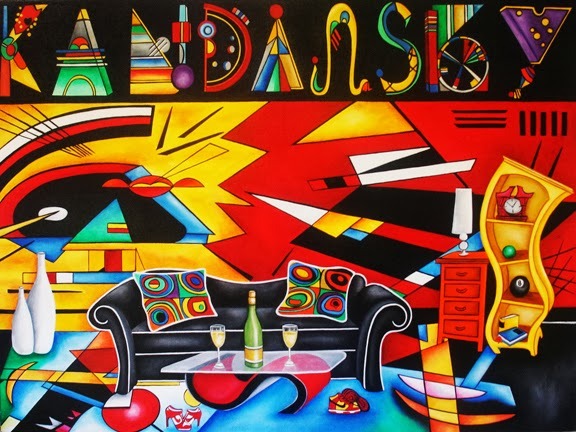 Nothing better than high heeled Nikes to go with a Kandinsky! Published in 1911, Kandinsky's book compares the Spiritual life of humanity to a pyramid - the artist has a mission to lead others to the pinnacle with his work. The point of the pyramid is those few, great artists. It is a spiritual pyramid, advancing and ascending slowly even if it sometimes appears immobile. During decadent periods, the sou sinks to the bottom of the pyramid; humanity searches only for external success, ignoring spiritual forces. Colors on the painter's palette evoke a double effect: a purely physical effect on the eye which is charmed by the beauty of colors, similar to the joyful impression when we eat a delicacy. This effect can be much deeper, however, causing a vibration of the soul or an "inner resonance"—a spiritual effect in which the color touches the soul itself. 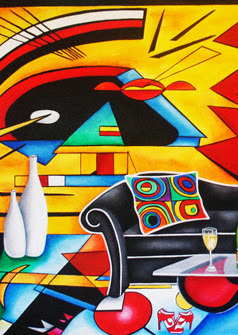 "Inner necessity" is, for Kandinsky, the principle of art and the foundation of forms and the harmony of colors. He defines it as the principle of efficient contact of the form with the human soul. Every form is the delimitation of a surface by another one; it possesses an inner content, the effect it produces on one who looks at it attentively. This inner necessity is the right of the artist to unlimited freedom, but this freedom becomes license if it is not founded on such a necessity. 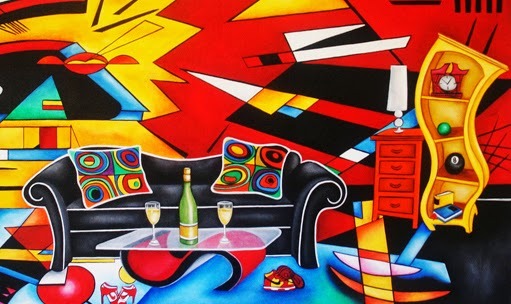 Art is born from the inner necessity of the artist in an enigmatic, mystical way through which it acquires an autonomous life; it becomes an independent subject, animated by a spiritual breath.